Plant-based living, in general, is not cheap. While I am still coming out ahead of my omnivorous days, no longer purchasing sirloins and brie, to eat high quality, fresh, organic “real food” can still be costly. Consuming sometimes twenty different fruits and vegetables in a day requires real diligence in seeking out the best prices for produce (as well as whole grains, beans, lentils, nuts, and seeds). Travis’s parents introduced us to a farmers’ co-op called Bountiful Baskets. I’ve mentioned BB before, but today, plan to go into a bit further detail about what a value it really is. Each week, the sale opens online on Monday and closes on Tuesday for pickup on Saturday. Popular items—like the organic fruit and vegetable basket—sell out quickly, so you have to be on your game. We head over to the BB website to place our order. You have a choice between a regular basket ($15) or organic ($25), plus extra add-ons like whole grain bread, tortillas, granola, and bulk produce. These add-ons change each week, as do the contents of the baskets. 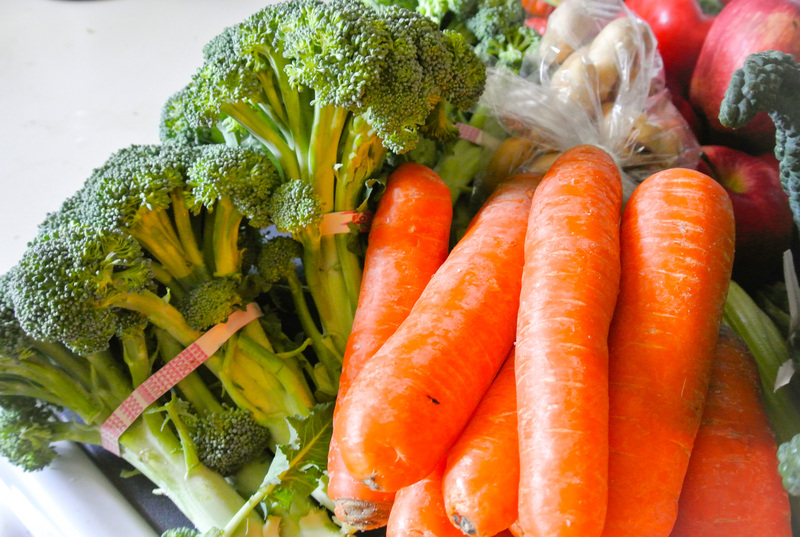 You can count on a 50/50 mix of fruits and vegetables, but the rest is a surprise. 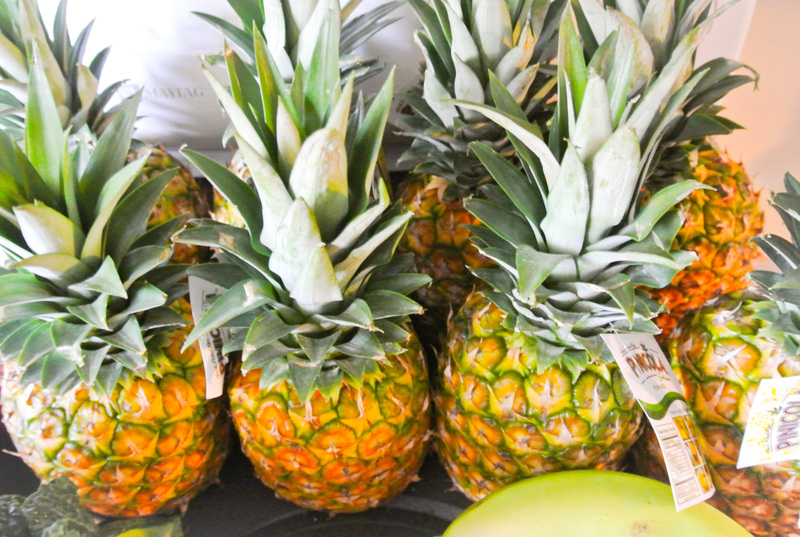 Anyway, the add-ons that we selected this week were pineapples (twenty-one pounds, to be exact) and what the BB website called a “Freezer Pack.” The FP contained a large quantity of broccoli, carrots, and asparagus. We are keeping half of these vegetables and two of the eight pineapples fresh in the fridge and chopping the rest to go in the freezer. Below, you can see that we filled one-gallon food storage bags with chopped vegetables that will be ready to dump into a pot of vegetable stock for a quick soup. 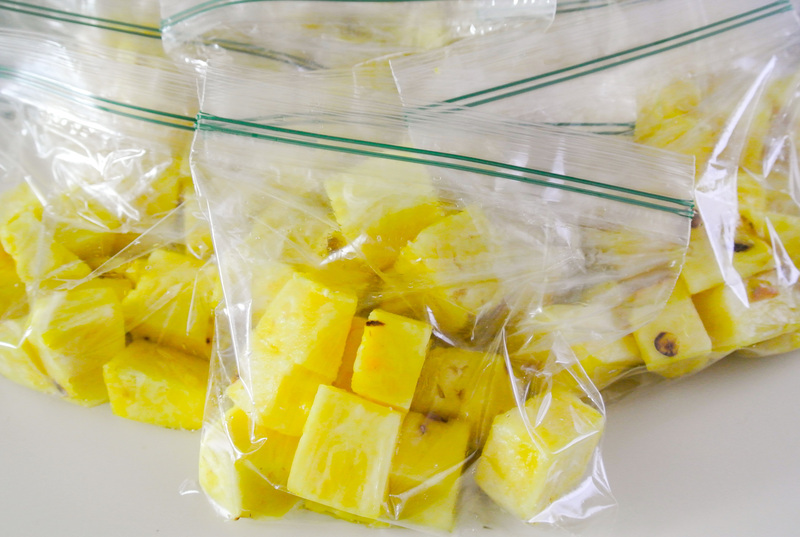 The pineapple chunks, since they will inevitably freeze into one solid unit, are in smaller baggies, the perfect size for smoothies. When add-ons like these—or similar bulk deals in the supermarket—come along, we always stock up and get creative. A couple of months ago, for example, we paid BB an extra $20 for twenty-five pounds of organic tomatoes which we promptly turned into homemade marinara sauce. This was frozen in food storage containers in perfect portions to accompany a box of pasta (or the equivalent in fresh eggless pasta). Today, we are cracking into the last one. Living a plant-based lifestyle, for us, is still cheaper than being omnivores, in part because we seek out deals and find creative ways to preserve produce that we have stocked up on. Many of the deals come with the seasons and holidays. I don’t often purchase pecans and walnuts, for instance, because they are among the more expensive nuts, but my farmers’ market had longstanding sales on these around Thanksgiving and Christmas, at which point I bought a whole bunch that lasted us for months. 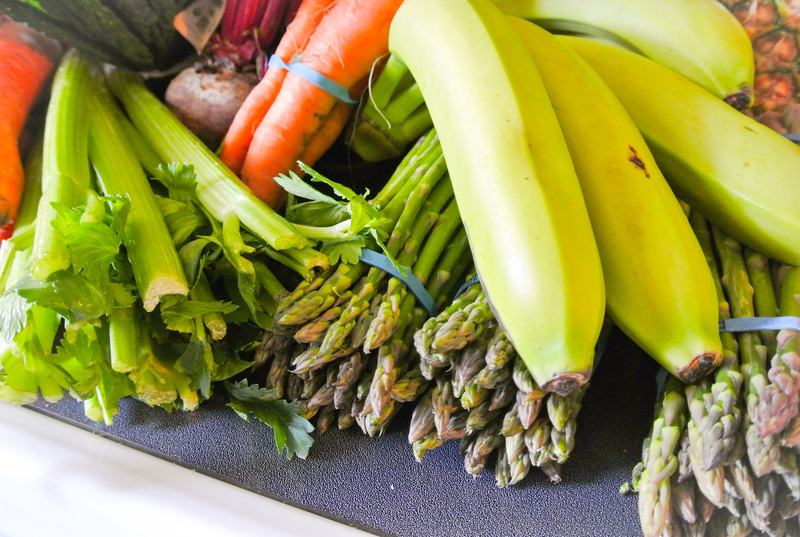 In addition, since we don’t buy prepackaged frozen food, our freezer typically always has room to store produce that we have peeled, chopped, or otherwise prepared ourselves. 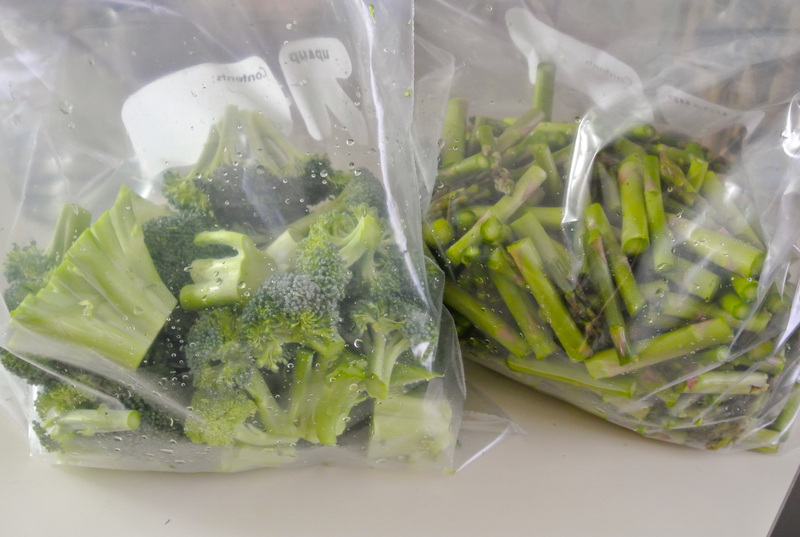 We freeze fruits and vegetables in convenient portions for the anticipated future application. This forethought comes in especially handy when it looks like there is “nothing to eat” and then I open the freezer and remember that I have soup-in-a-bag ready to go. The photos in this post display $57 worth of produce, most of which is organic. 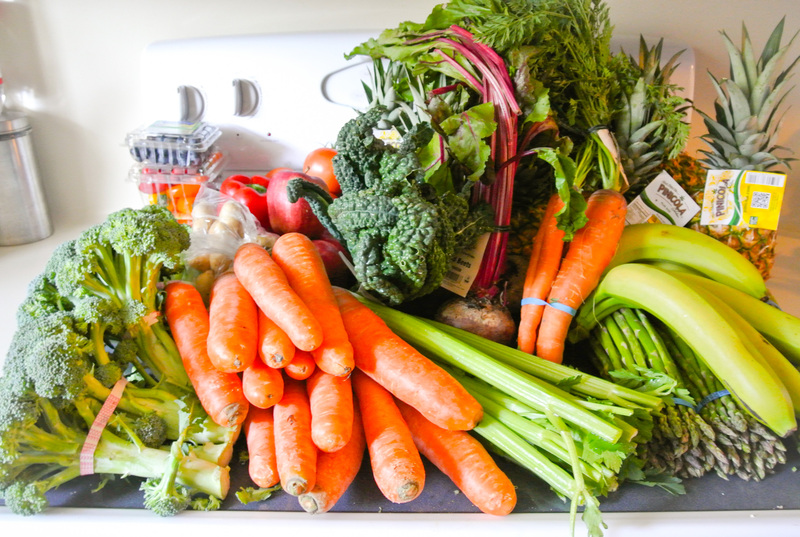 The fresh produce will last us a week or two, but the frozen weeks or months beyond that. The fact that this is a smokin’ deal not enough for you? The extra produce and forgotten pickups are donated to local fire stations. 🙂 See if you can find a farmers’ co-op program in your area!